Famed designer of the Morgan dollar, George T. Morgan, was selected to design the coin. 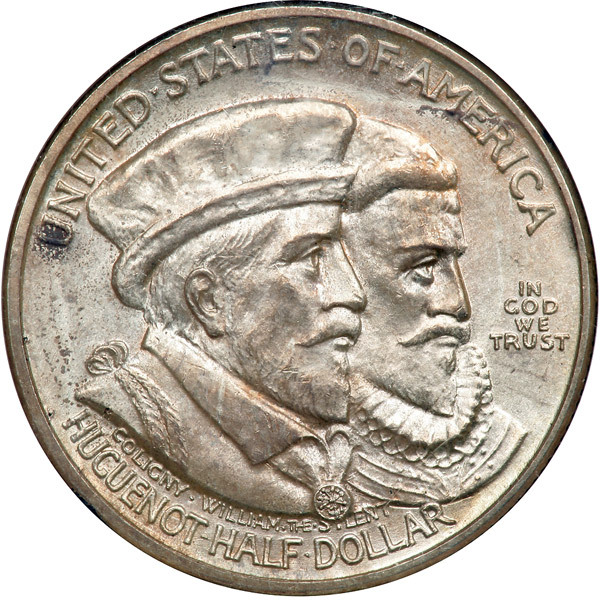 The obverse depicts the conjoined portraits of Admiral Gaspard de Coligny and William the Silent, both of whom were Huguenot martyrs assassinated decades before the founding of New Netherland. 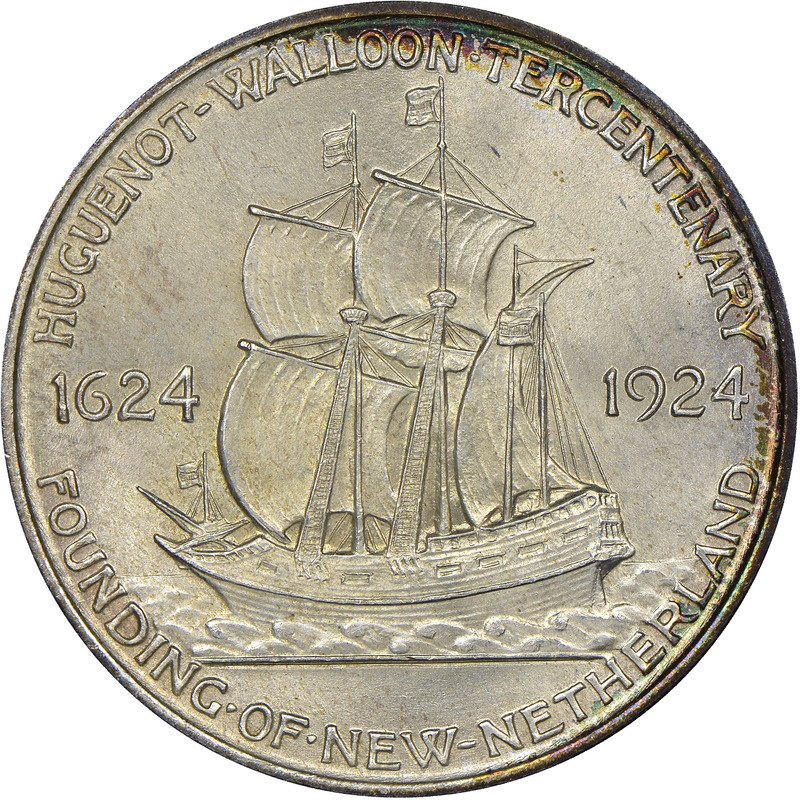 Also included are UNITED STATES OF AMERICA arced above their heads, with HUGUENOT HALF DOLLAR below, and IN GOD WE TRUST in small letters to their right. 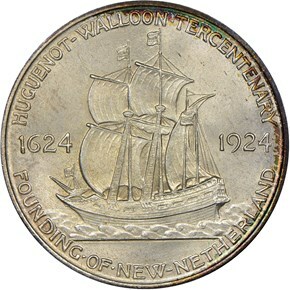 The reverse depicts the Huguenots’ ship, the Nieuw Nederlandt, with HUGEHUENOT-WALLOON TERCENTENERARY above, and FOUNDING OF NEW NETHERLAND below. Flanking the ship on either side are the dates 1624 and 1924. 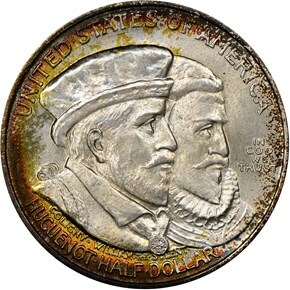 After some serious revisions to make the coins easier to strike, the Commission of Fine Arts approved the final models. 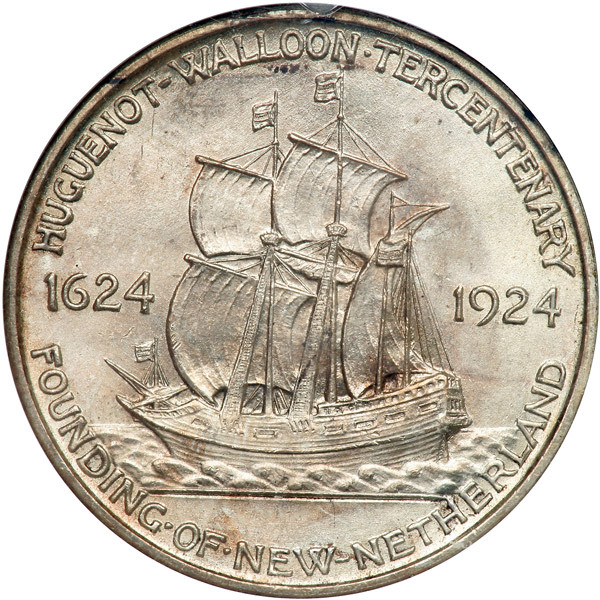 In early 1924, 142,000 Huguenot commemoratives were coined in Philadelphia. Of that total, 87,000 were sold to the public at the price of $1 each through the Fifth National Bank of New York. While the remaining balance of 55,000 coins should have been returned to the mint for melting, that doesn’t seem to have happened in this case. Those coins were actually released directly into circulation. That leaves this issue with a final mintage of 142,000.